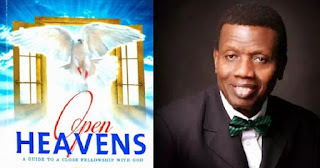 Open Heaven [4 June 2018] Know Your Rights in God - Open Heavens Daily Devotional Messages, By Pastor E.A Adeboye. Many children of God are genuine in their Christian walk, but they do not know their rights in God. For this reason, they unfortunately still live at the mercy of the enemy. A classical example of someone who knew his position in God is Elijah. Exactly what Elijah decreed was what happened, and this happened twice before the third group of soldiers learnt their lesson. The move of God is not found in the multitude of words or in vain repetitions but in the power of Holy Ghost. However, you cannot walk in this realm without knowing who you are in Christ. Based on today’s Bible text, I have often taught my children that Paul has some credit in his account with God, and so for his sake lives were saved from physical perdition. Having given his all to Christ, he was conscious of the credit he had with Him. For this reason, when he suffered shipwreck with a host of others prisoners, crew and soldiers, he prayed that God should spare their lives. He even encouraged them to eat because God had spoken with him, assuring him of the safety of every life in the ship. Many lessons can be derived from this, the most profound of these being that Paul knew his position in Christ. In other words, He understood his rights in Christ.